Catcher is a position for a baseball or softball player. When a batter takes his/her turn to hit, the catcher crouches behind home plate, in front of the (home) umpire, and receives the ball from the pitcher. This is a catcher's primary duty, but he is also called upon to master many other skills in order to field his position well. The role of the catcher is similar to that of the wicket-keeper in cricket. Positioned behind home plate, the catcher can see the whole field; therefore, he/she is in the best position to direct and lead the other players in a defensive play. The catcher typically calls for pitches by means of hand signals; therefore, he/she must be aware of the pitcher's mechanics and strengths, as well as the batter's tendencies and weaknesses. Foul tips, bouncing balls in the dirt, and contact with runners during plays at the plate are all part of the catcher's job, so protective equipment must be worn. This includes a mask, chest and throat protectors, shin guards, and an extra-thick glove. Because the position requires a comprehensive understanding of the game's strategies, the pool of former catchers yields a disproportionate number of Major and Minor-League managers, including such prominent examples as Connie Mack, Steve O'Neill, Al Lopez, Yogi Berra, Gary Carter, Mike Scioscia, Bruce Bochy, Joe Torre, Joe Girardi, Mike Matheny, Ned Yost and Brad Ausmus  The physical and mental strain of being involved on every defensive play can wear catchers down over a long season, and can have a negative effect on their offensive output. Due to catching's strategic defensive importance, if a catcher has exceptional defensive skills, teams are often willing to overlook their relative offensive weaknesses. A knowledgeable catcher's ability to work with the pitcher, via pitch selection and location, can diminish the effectiveness of the opposing team's offense. Many great defensive catchers toiled in relative anonymity, because they did not produce large offensive numbers. Notable examples of light-hitting, defensive specialists were; Ray Schalk, Jim Hegan, Jim Sundberg and Brad Ausmus. Schalk's career batting average of .253 is the lowest of any position player in the Baseball Hall of Fame. That he was selected for enshrinement in 1955 was largely a tribute to his outstanding defensive skills. Catchers are often able to play first base and less commonly third base. As the game progressed towards professionals and became more serious, pitchers began to attempt to prevent the batter from hitting the ball by throwing faster pitches. With the introduction of the called strike in 1858, catchers began inching closer to home plate due to the rules requirement that a strikeout could only be completed by a catch. The rules governing the delivery of pitches proved to be hard to enforce, and pitchers continued to stretch the boundaries of the rules until by the 1870s, the release point of pitches had reached the pitcher's waist level. The rising velocity of pitches in conjunction with catchers moving closer to home plate significantly increased the risk of injuries for catchers, especially face and hand injuries. By the late 1870s, catchers began to use padded, fingerless gloves to protect their hands, and in 1877 the first protective catcher's mask was used. The first catchers to use protective masks sometimes had their courage called into question, but the effectiveness of the masks meant that they became widely accepted. In the 1880s, the first padded chest protectors came into use, and in 1888 specialized catcher's mitts used on the non-throwing hand began to be used. The catcher can help his pitcher get more strike calls from the umpire by using a technique called "framing". This practice is a matter of a catcher keeping his mitt inside the strike zone, or as close to it as possible, when receiving the pitch, thereby giving the plate umpire the impression that the pitch is in the strike zone, even if it is not. When framing, a catcher will also hold his mitt still for a second or two so that the umpire has an opportunity to thoroughly consider his call (and, hopefully, let his innate biases influence his decision in a direction favorable to the catcher's team). Calling the game refers to the act of catchers to decide the type of pitch delivered to home plate. Catchers comprise a high percentage of baseball managers. As of April 2011 15 of 30 Major League Baseball managers were former catchers. Because the catcher is considered a captain on the field (and some, such as Thurman Munson and Jason Varitek were in fact team captains), he is often in charge of planning defensive plays. The catcher will give signs to the pitcher for what pitch is to be thrown. The majority of the time it is done through a number system. Each number will represent a different pitch, and then the pitcher can either agree or disagree with a shake of his or her head. These signals get more complicated when a runner is on second base, because the runner's vantage point when he takes his lead gives him a direct view of the catcher's hand and a simple signal can be relayed by the runner to the batter. Signals are not always done by the number system. Varitek was known for giving signals by touching certain parts of his chest protector. 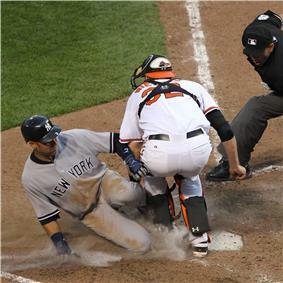 To block balls that a pitcher throws on a bounce toward home plate (pitches that are said to be "in the dirt"), the catcher will slide his body to the left or right, as necessary, to place himself directly in the path of the ball. Once in position, he drops to his knees, places his mitt between his legs to prevent the ball from passing through, and leans forward to deaden the rebound when, and if, the ball bounces off his thigh or torso. Although inexperienced catchers may try to catch the errant pitch with his mitt, coaches often prioritize the catcher's ability to "keep the ball in front of him" than to make a catch with his mitt. Ideally, the catcher will be able to knock the ball to the ground where it will stop within arm's reach. 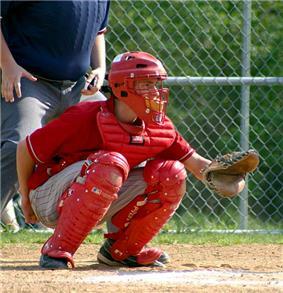 To perform this properly, without the ball being deflected in an undesirable direction, the catcher must angle his body so that his chest is always leaning forward, toward home plate. This maneuver is often difficult, and its difficulty depends largely on how fast the ball is traveling, where it first hits the ground, the firmness of the ground it hits, and the manner in which it is spinning. Preventing wild pitches and avoiding passed balls. Although the pitcher has a responsibility to throw with reasonable accuracy, catchers must be mobile enough to catch (or block) errant pitches. By doing so, a catcher prevents baserunners from advancing while the loose ball is retrieved. An errant pitch that eludes the catcher and allows a baserunner to take one or more additional bases is called a wild pitch. (Techniques for blocking wild pitches are described in the previous section.) A pitched ball which would require only ordinary effort to be caught or blocked by the catcher — but is nonetheless misplayed, allowing a base runner to advance — is called a "passed ball". In certain game situations, when a runner is on first and the batter bunts the ball or hits the ball softly in which causing the third baseman to rush in to get the ball and throw to first base, the catcher must cover third base so that the runner from first base does not advance to third base on the play and this then forces the third baseman to cover home plate. Catchers also are prone to knee ailments stemming from the awkward crouching stance they assume. Because of this, catchers have a reputation of being slow baserunners; even if they have speed at the beginning of their careers, the eventual toll taken on their knees slows them down, although there are some exceptions, such as Manny Sanguillén and Alex Avila. Some players who begin their career as catchers are moved to other positions in order to preserve their running speed, increase their availability for games, and take advantage of their prowess with the bat. Prominent examples of catchers switching position in mid-career include Mike Napoli, Craig Biggio, B.J. Surhoff, Joe Mauer, Brandon Inge, and Dale Murphy (although Murphy was also known as a poor thrower to the pitcher and to second base, nearly hitting pitchers in the process). As a result, catchers often have shorter careers than players at other positions; consequently, few catchers hold batting records that require many seasons of play to compile. Mike Piazza is the only catcher in history with more than four hundred career home runs, and no catcher has amassed three thousand career hits. Although 3000-hit-club member Craig Biggio played his first three full seasons as a catcher, he played his remaining sixteen seasons at second base and in the outfield. ^ a b c d e Andriesen, David (November 2003). Catchers Are Baseball's Least Appreciated Players. Baseball Digest (Books.Google.com). Retrieved 9 March 2012. ^ a b Doyle, Al (June 1997). Never Underestimate A Good Defensive Catcher. Baseball Digest (Books.Google.com). Retrieved 9 March 2012. ^ Vass, George (May 2005). For Catchers, The Name of the Game is Defense. Baseball Digest (Books.Google.com). Retrieved 9 March 2012. ^ a b c d e f g h i j k l m n o p q r Morris, Peter (2010). Catcher: How the Man Behind the Plate Became an American Folk Hero. Government Institutes. p. 41. ^ Rawlings Sporting Goods Company (July 1963). Evolution of the Ball. Baseball Digest (Books.Google.com). Retrieved 11 July 2012. ^ 'Encyclopedia of Baseball Catchers'' – Left-Handed Throwing Catchers"'". Members.tripod.com. Retrieved 2013-09-21. ^ "Where are the lefty catchers?". Myespn.go.com. Retrieved 2013-09-21. ^ "Personal Catcher - BR Bullpen". Baseball-reference.com. Retrieved 2013-09-21. ^ "Tim McCarver Show - About Tim McCarver Baseball Career". Timmccarver.com. Retrieved 2013-09-21. ^ "Niekro finally flutters into Hall of Fame Braves knuckleballer's 15-year wait ends as he is only inductee - Baltimore Sun". Articles.baltimoresun.com. 1997-01-07. Retrieved 2013-09-21. ^ "Daily News America - Breaking national news, video, and photos - Homepage - NY Daily News". Articles.nydailynews.com. 2013-09-11. Retrieved 2013-09-21. ^ Knox Bardeen %BloggerTitle% (2009-07-17). "Greg Maddux Inducted Into Atlanta Braves Hall of Fame". Aolnews.com. Retrieved 2013-09-21. ^ "Dale Murphy » - Biographies of famous people : Famous People biography Biography - World Famous Biographies- Biographies of famous people : Famous People biography". Profiles.incredible-people.com. 1956-03-12. Retrieved 2013-09-21. ^ "Price Levitra UK. Buy Order Levitra - FDA APPROVED Drug Store". Baseballlibrary.com. Retrieved 2013-09-21. Ginn TA, Smith AM, Snyder JR, Koman LA, Smith BP, Rushing J (2005). "Vascular changes of the hand in professional baseball players with emphasis on digital ischemia in catchers". Journal of Bone & Joint Surgery 87 (7): 1464–9.